poetry tREnD is a poetry translation project initiated by Aprilia Zank and based on collaboration between the poetry p f showcase of poets writing in English, either fully established or clearly en route (founder and editor: Anne Stewart), and d i c h t h a u e r, a students’ literary workshop, whose members are young poets and translators from Ludwig-Maximilians-University of Munich, Germany. This project runs parallel to and in cooperation with poetry pRO, a similar translation project initiated by Prof. Lidia Vianu within her Translation Café at the University of Bucharest, Romania. 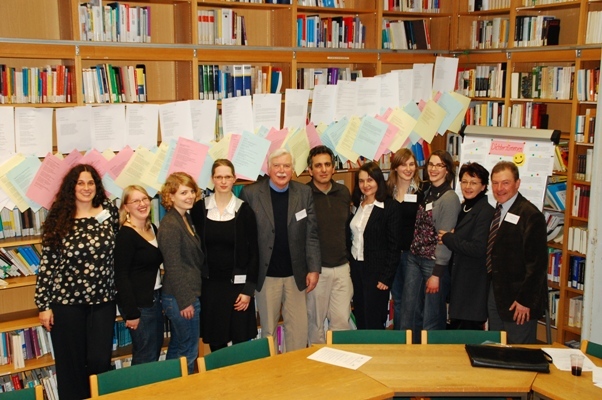 The d i c h t h a u e r (literally “poetry sculptors”) are members of a literary workshop initiated by Aprilia Zank at Ludwig-Maximilians-University in 2006. It unites students and PhD students, who are keen on further developing their poetic skills. A few can already boast poetry prizes, others are at the beginning of their literary career. In this respect they are happy to have the support of well-known international poets such as Rodney Pybus, Jennifer Phillips, Gabeba Baderoon, José Oliver, who have been willing to provide comments, advice or encouraging remarks on the accomplished work. 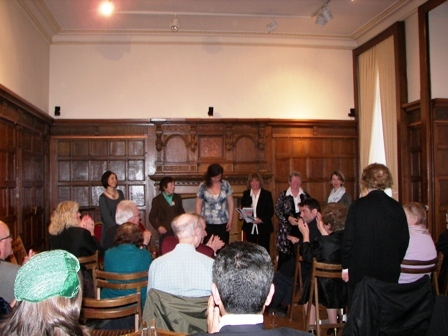 The DICHTHAUER translators browsed the poetry p f site and selected poets whose work they would like to translate and the poets (12 initially, 26 as at 1st Sep 10) were invited to take part. As with poetry pRO, the poets concerned have agreed to allow the translations plus publication online, in journals and where other opportunities arise. 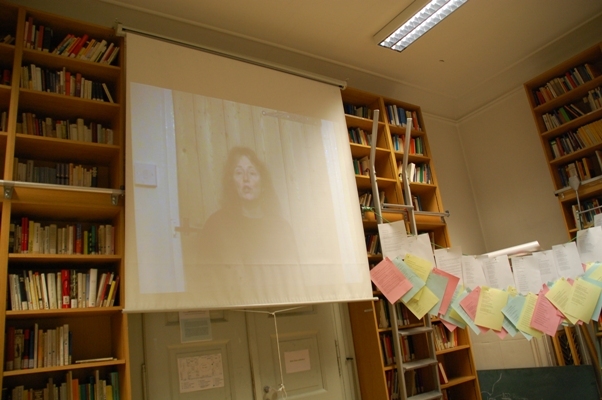 Translation Café is a review of contemporary texts in translation and E-learning founded by Prof. Lidia Vianu in 2007. It offers an online seminar of literary translation and a session of E-learning in the MA Programme for the Translation of the Contemporary Text, directed by Lidia Vianu. Her team of MA and PhD students and professors, as well as English-speaking writers, are involved in a manifold process of discussing, analysing and translating literary texts in English, notably contemporary poetry. Living language – to make language living, that is my big dream. So I do my best to fulfil it : I study German, Phonetics and Psychology at Ludwig-Maximilians-University in Munich, spend my free time learning foreign languages and teaching my mother tongue and, most of all, following my deep love of poetry, I write and translate poems. Miriam studies English Literature, Comparative Literature and French at Ludwig-Maximilians-University in Munich. Thanks to her subjects, Miriam has been able to pursue her passion for literature and her concern for foreign cultures. Translating means, for her, being able to combine these interests. Anna studies German as a Foreign Language, English and Italian at Ludwig-Maximilians-University in Munich. She has always been fascinated by languages and considers that thoughts are sometimes impossible to translate. Still she is willing to accept the challenge and try to make possible the transmission of poetic thinking from one language to another. Barbara studies Ethnology, German as a Foreign Language and Communication Sciences in Munich and Paris. She wrote her first poem, about the Gulf War, at the age of seven. Ever since, whenever her sad incomprehension of things happening urges her to put it into words, poetry has been a vital process for her, as well as a way to grasp the incomprehensible and to express the inexpressible. I study German Literature, Comparative Literature and Literature of the Middle Ages at Ludwig-Maximilian-University in Munich. One might say it is an one-sided thing to do, but nothing grips me more than literature. Although I prefer to write prose, it is verse I like best to work with and it is a special challenge for me to convey meaning beyond the limits of language. Originally from Greece, Chrissanti is a student of Comparative Literature at Ludwig-Maximilian-University in Munich and project leader for "LYRIKlos! ", which deals with German contemporary poetry: "Poetry doesn't always have to be agreeable and doesn't ask the poet to be so either, which makes for an easy start to a relationship between the two. The inner need to state something was what brought us together." Barbara studied German Literature, German Linguistics and Art History in Munich and Coimbra. She writes prose and poems, some of which have been published in magazines. She also worked as an editor for a non-profit literary journal for young people. Currently Barbara is a PhD student involved in experimenting with literary texts in space, with a view to gaining fresh insights into the production and reception of literature. I am PhD student (German Language and Literary Studies) at LMU Munich, and also interested in foreign languages and the transposition of literary texts, prose and poetry, into other languages and cultures. To take part in this translation project is a further opportunity to enlarge my literary horizon. Nils studies German Literature, American Literature und American Culture at Ludwig-Maximilians-University in Munich. Likes the sound the rain makes during the night. Writes a book never to be finished. Every now and then poems and broken hearts. Boyband-melancholy and hand-crafted human abysses. Michael was born in 1985, studies German Literature, Theatre Sciences and the History of Art in Munich and Venice. Member of several groups of poets, e.g. “d i c h t h a u e r“. Writes poems, but also short stories and theatre plays. Michael has won two prizes for his literary writing. His texts are published in magazines and anthologies. Lecturer for Creative Writing for young people. Several longer stays in the USA and UK as well as my affection for the arts have led me to study English Literature, Intercultural Communication and German as a Foreign Language in Munich. I mainly write short stories, but have also published my first biography. I experience translation of poetry as an intimate endeavour; in peeling away a poem’s – often invisible – layers, one is quickly drawn into its very depth. Lukas studies German as a Foreign Language, Italian and General Linguistics at Ludwig-Maximilians-University in Munich . He evidently cherishes a soft spot for languages and has treasured literature for a very long period now. He is keen on the new perspectives brought to him by translating poetry. Sabine Stiglmayr was born and brought up in southern Bavaria.After high school she studied Early Music at Brucknerkonservatorium Linz and at the Hogeschool voor Muziek en Dans Rotterdam. In addition to her musical endeavours she avidly pursues an affection for language and languages. She studies Literature, European Ethnology and German as a Foreign Language in Vienna and Munich, where she lives with her daughter Rosa. Born in Romania, resident in Germany, PhD student and freelance lecturer at Ludwig-Maximilians-University in Munich. Aprilia writes verse in English and German, and translates poetry from and into English, German, French and Romanian (in poetry tREnD, Translation Café and literary periodicals). Poetry means to her the attempt to get a unique insight into the hidden side of things. Anne Stewart ‘discovered’ a passion for poetry in her 40s and, five years on, began working towards a life where poetry was key and where she could make her own serious contribution to the poetry pool. She is founder and editor of poetry p f and a provider of services to poets and poetry organisations. She was awarded an MA (Distinction) from Sheffield Hallam University in 2003 and included in the "Ten Hallam Poets" anthology (Mews Press 2005). Her work is published in a growing list of magazines, anthologies and web & e-zines and her first collection, The Janus Hour, was published by Oversteps Books in 2010. Lidia Vianu is Professor of Contemporary British Literature at Bucharest University . She is the Director of the online translation review Translation Café. She was awarded the London Poetry Society biennial Prize for Poetry Translation ‘Corneliu M. Popescu’, London 2005. Her work includes criticism on contemporary British literature, anthologies of contemporary literature, translations, poetry, fiction. Aprilia Zank is a freelance lecturer at Ludwig-Maximilians-University in Munich. She writes poetry in German and English, and is winner of a poetry award at ”Vera Piller Poetry Contest“ in Zürich, 1989. Her poems have been published in literary periodicals and in anthologies both German and English. She also translates poetry from and into German, English, French and Romanian, among others at Prof. Lidia Vianu’s Translation Café (online) and for the Romanian magazine Jurnalul literar. 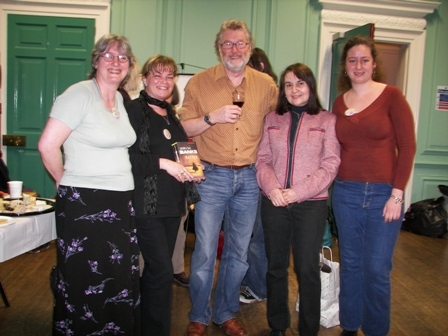 Open Day - February 2009 - a year gone by already! On the occasion of the jubilee edition tREnD 10 the D I C H T H A U E R (translators of poetry tREnD) organized an Open Day at Ludwig-Maximilians-University, Munich with bilingual readings, lectures (Dr. Nima Mina, London School of Oriental and African Studies, Dr. Esselborn, LMU) and other program-points that offered an insight into the actual translation work in their workshop. Photos of the reading authors, translators, lecturers and guests are available here at D I C H T H A U E R - and just a small selection below. 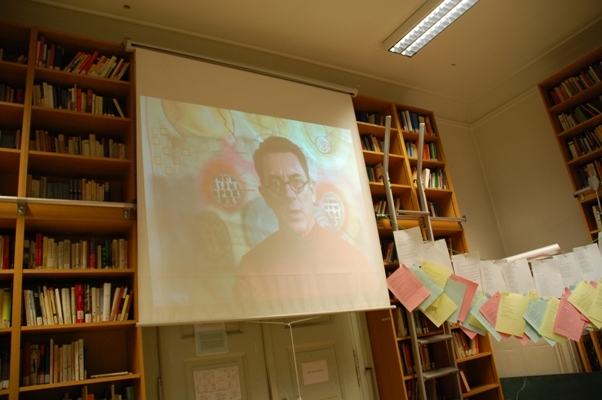 In December 2008, the tREnD poets were invited by Aprilia Zank to create video recordings of themselves reading a poem. Several actually managed to do it! 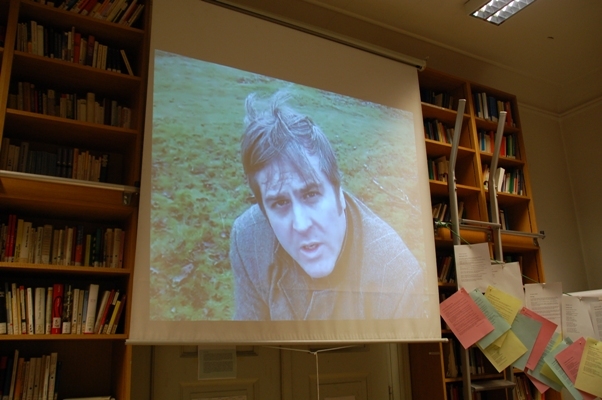 The videos were beamed onto the screen throughout the Open Day and snaps taken at various points to provide these stills. The room was 'strung about' with prints of the poems and translations. 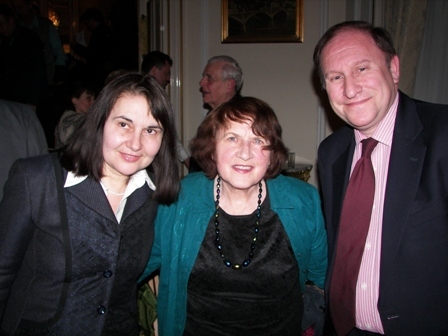 at events on the poetry pRO Romanian UK Tour in March & April 2009.